Military retirees have new options for dental and vision care starting Jan. 1, but the changes won’t be automatic. To remain covered, they’ll have to make some decisions and take specific action beginning Nov. 12. 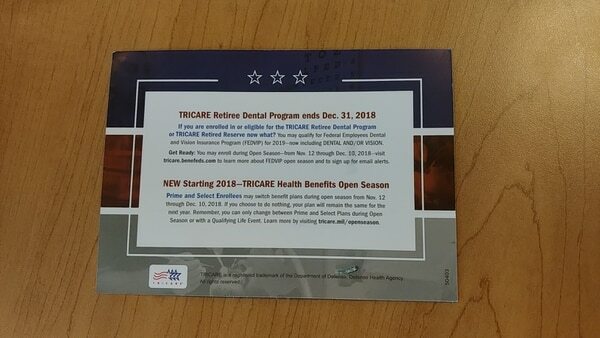 The Tricare Retiree Dental Program ends Dec. 31 and will be replaced by the Federal Employees Dental and Vision Insurance Program. Most military retirees and their families who are enrolled in Tricare will be able to enroll in FEDVIP for dental coverage, vision coverage or both. Military officials have been getting the word out in a variety of ways, include postcards to the millions of retirees and families eligible for the coverage. Active-duty family members are eligible to sign up for vision coverage under FEDVIP, but not dental coverage. Active-duty members and their family members may still enroll in the Tricare Dental Program. The vision coverage, including eyeglasses or contacts, is in addition to the routine eye examination benefit that many beneficiaries currently have under Tricare Prime or Select. That FEDVIP coverage will be effective Jan. 1, but you can’t enroll in FEDVIP just yet. The enrollment period is during the federal benefits open season, which runs Nov. 12 through Dec. 10. Retirees and their family members must enroll during the open season to get that dental and/or vision coverage in 2019. The only way to enroll in the FEDVIP, or change that coverage, outside of that enrollment period is if there has been a qualifying life event: a marriage, for example, or retirement from the military. During the open season, you can choose between 10 dental carriers and four vision carriers. In some cases, the dental carrier is limited to certain regions of the country; other dental carriers provide national and international coverage. Some carriers offer standard coverage as well as a premium plan. Those who tend to need more costly dental procedures, or expect to, might consider whether the higher-cost coverage is more cost-effective. The 2019 rates and plan information for the carriers isn’t expected to be available until around mid-October. Make sure your information is up to date in the Defense Enrollment Eligibility Reporting System, better known as DEERS. Defense Health Agency officials have sent postcards to all military retirees who are eligible to enroll in FEDVIP, Dwyer said. If you haven’t received a postcard, that may mean that officials don’t have a good mailing address for you. Go to the FEDVIP site for military beneficiaries, operated by the Office of Personnel Management: https://tricare.benefeds.com/InfoPortal/indexAction. There you’ll find information about the program, and you can get an idea of what the different carriers offer and how it works, by looking at the 2018 rates. Remember, those numbers will likely change. At Tricare.benefeds.com, you can sign up for updates about the FEDVIP program, by email and text. 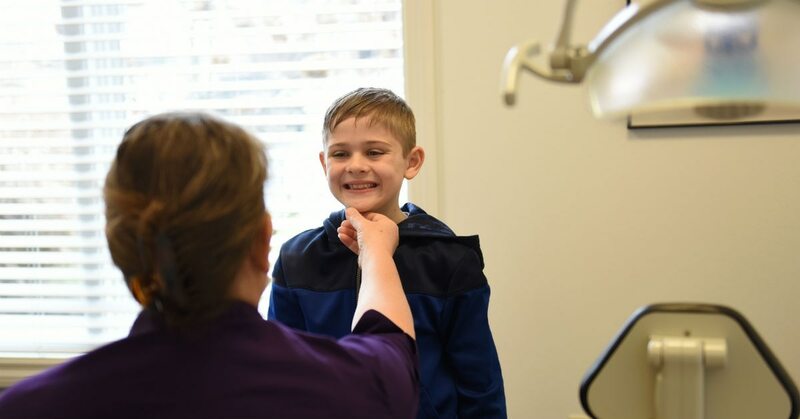 Some families already are seeking advice from their dentists on which plan best suits them, said Karen Ruedisueli, government relations deputy director for the National Military Family Association.